A young man who was involved in a romantic relationship with a woman old enough to be his mother probably for the sake of money, has regretted his actions after cheating on her. 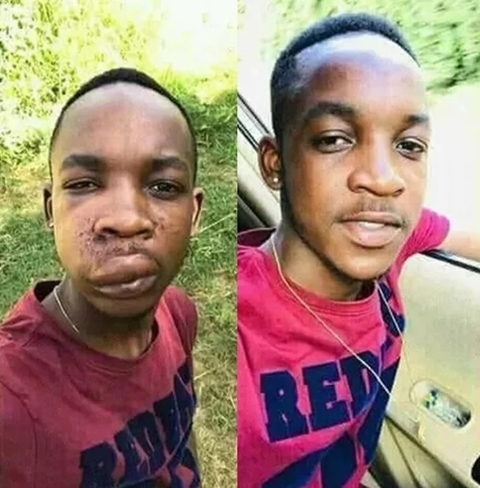 A 26-year-old man who is dating a 54-year-old woman in the Lusaka area of Zambia, has been beaten to a pulp by his sugar mummy. According to multiple online reports, the young man who shared before-and-after photos on social media was dating the businesswoman and decided to cheat on her. It was gathered that the woman, whose name was revealed as Maggie, beat up her boy toy after she allegedly caught him with a younger lover. The angered woman after catching her toy boy, took the law into her hands and beat the young man like a little child, punishing him for messing with her heart.